I discovered this Spiked Knotted Cable Chain in Edith Johns Creative Stitches (p. 53) This mouthful of a name is one of those stitches that at first glance I thought it was too complex to hold much interest. Then once I was in the swing of it my opinion shifted a this stitch forms an interesting texture and is more versatile than I first thought. Spiked Knotted Cable is one of those stitches that build on established hand skills. 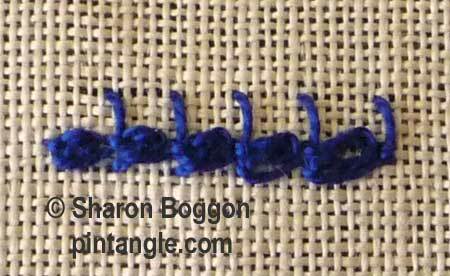 You need to be able to work twisted chain, and preferably to have mastered oyster stitch. This stitch starts with a twisted chain and builds from there. So bring the thread through the fabric from the back then insert the needle at an angle with the point emerging from the fabric pointing to the left. Cross the thread over the needle and wrap the thread under the needle point. 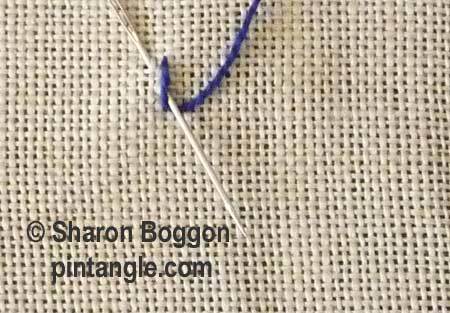 Pull the needle through the fabric to make a twisted chain stitch. Slide your needle under the thread at the top of the twisted chain (as illustrated). Pull your needle through. Note at this stage you are not going through the fabric just under the thread. 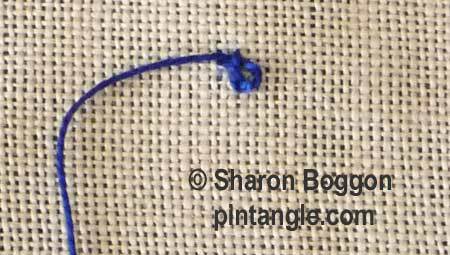 Make a snug knot but take care not to pull your thread too tightly. Below the twisted chain insert your needle on the right. 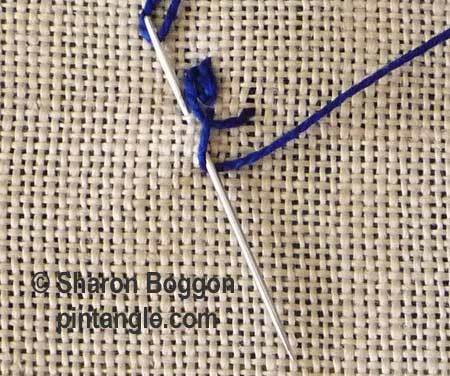 As illustrated have your needle point inwards, with the point emerging inline to the top right of the first twisted chain stitch. 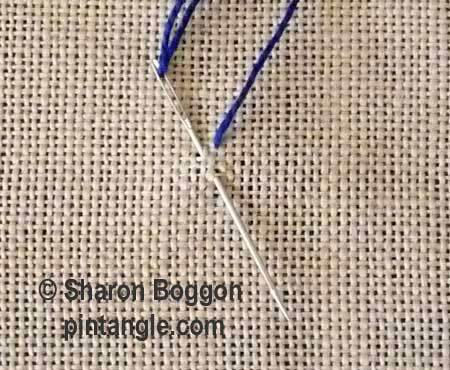 Keep the thread under the needle (as you would in buttonhole stitch).Pull your needle through. 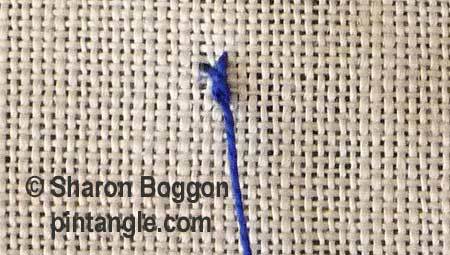 This creates the first Spiked knotted cable stitch. 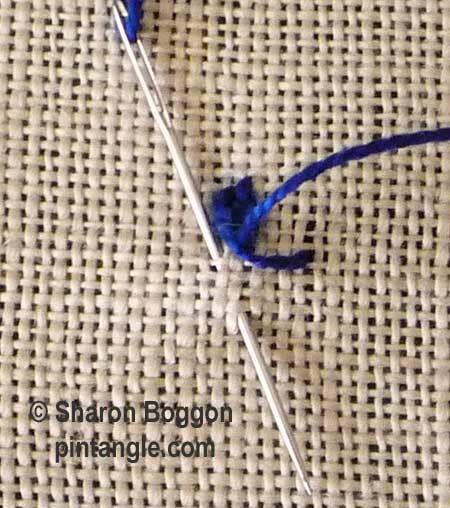 Once again insert the needle through the fabric bringing the point of the needle out a short way along the line and wrap your thread over the needle, then wrap the thread under the needle. 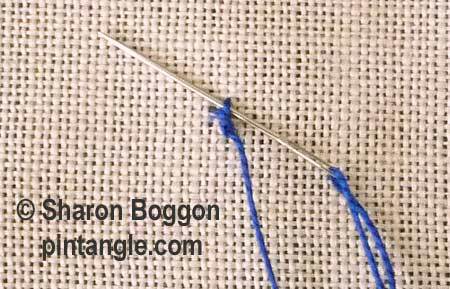 Pull the needle through the fabric and continue as you did on the first stitch. As you can see Spiked Knotted Cable Chain creates a very interesting line and being a chain stitch you can work it on a curve too. I hope you enjoy spiked knotted cable chain stitch! A fun stitch, not so hard. I’m looking forward to the stitch this week, I’ve never done this one before.